Product categories of T Series Pallet Wrapping Machine, we are specialized manufacturers from China, Pallet Wrap Machine, Plastic Wrapping Machine suppliers/factory, wholesale high-quality products of Automatic Pallet Wrapper R & D and manufacturing, we have the perfect after-sales service and technical support. Look forward to your cooperation! 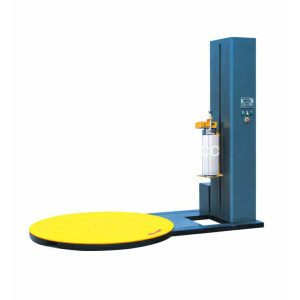 Turntable wrappers are mainly used for the packaging of big cargo or pallet that needs to be transport or stored. The pallet load/cargo is loaded onto the rotating turntable, which carries the pallet/cargo rotates so as to wrap the goods around. It is widely used in glass products, hardware, electronic appliances, paper-making, ceramics, chemicals, food & beverages, building materials and so on. This type of packaging is high in packaging efficiency, anti-dust, anti-moisture and reduce the labor cost & material cost. Customized machines available.